I remember purchasing my first camera several years ago, the first one that didn't require film to be developed. Over the years, I've continued to upgrade and slowly work on my photography skills. I enjoy taking pictures of my children, nature and now as a blogger, I take pictures of review products, food and so much more! One day I would love to set up my own office with an area specifically for photography with lights, colorful backdrops, props and more! Well, thanks to DropPlace, I'm checking one of those things off of my list! At DropPlace you will find a variety of vinyl backdrops and floors, they have been in business since 1991 and are located in Southern California. Photographers, parents, and bloggers everywhere will love the selection that DropPlace offers! From wood and floors to polka dots, stripes, even holiday designs, you will have no problem finding several designs that will win your heart over - all at an affordable price! 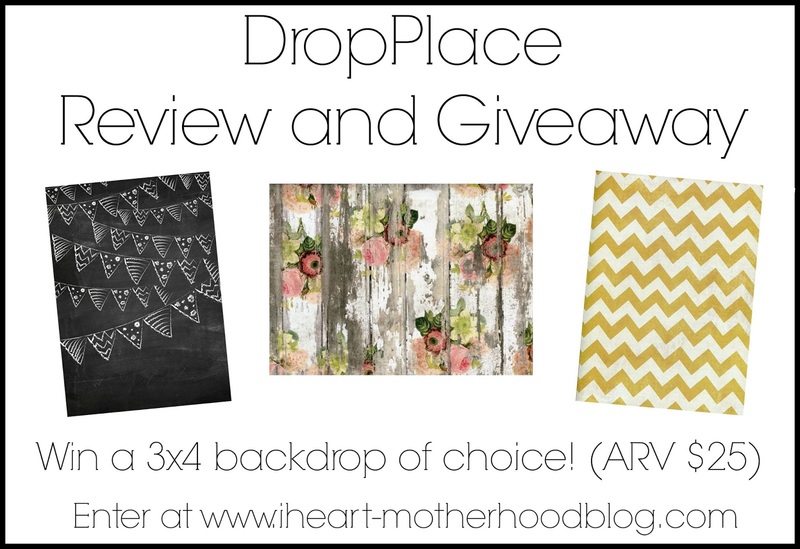 After browsing online at DropPlace, I decided on the Durable Matte Vinyl Floor/Backdrop Vintage White Painted Distressed Wood Grain/Planks. Vinyl is heavyweight, durable, it's wrinkle free and produces zero glare! Your backdrop or floor drop will arrive rolled in a heavy duty cardboard tube that makes it great for storage or to travel with! Backdrops or floor drops, are really great for almost anything! From head shots, to product or food photography, the possibilities are endless! I've really enjoyed playing around with my new backdrop from DropPlace, I'm already thinking ahead for holiday photo ideas and I can't wait to show ya'll more right here on the blog! So what do you think? What could you use a backdrop for? Connect: Be sure to stay connected with DropPlace on Facebook and Twitter! Buy it: You can purchase the Vintage White Painted Distressed Wood Grain/Planks backdrop online in 3x4, 4x5 or 6x8 sizes! I'd want a floor backdrop... I really like the Vintage Unfinished Weathered Wood Grain / Planks one! its so tough to choose!! Id love to win this for my sister who is trying to get more into her photography and she's always done my LO's pics. I think she would like the Christmas and Holiday one. its white with stars and would be so pretty. thank you! My favorite is the Just Across the Bridge backdrop. My favorite is the backdrop labeled "Just Across the Bridge". So many fun choices! I love Halloween & Fall so those are my favorites. Especially the Halloween drop that has the eerie looking gates! There's a lot that I like. One of my favorites is the Blue Paint Chips / 9732 drop. Thanks. I think the chalkboard background would be perfect for back to school pictures! My favorite is the Soft Pink Background with White Flowered Lace. It would be perfect in my new girly-girl bedroom. Thank-you!